Horoya AC will look for an upset result away to Esperance de Tunis when the teams meet in a Group B CAF Champions League match at the Olympic Stadium in Rades on Friday, 8 March 2019. Esperance come into the game placed at the top of the log with eight points from four matches, having recorded two wins and two draws. The Tunisian giants were last in action in the competition on February 12 when they defeated South Africa’s Orlando Pirates 2-0 at home, thanks to goals from Anice Badri and Haythem Jouini. Horoya, meanwhile, are second on the log, just one point behind Esperance after two wins, one draw and one defeat from their four matches in Group B. The Guinea club brought themselves back into quarterfinal contention on February 12 when they defeated Zimbabwe’s FC Platinum 2-0 in Conakry, with strikes from Ocansey Mandela and Hudu Yakubu. The ‘Blood and Gold’, who are the title holders in the Champions League, will guarantee a place in the knockout stage if they defeat Horoya, while a draw will also be enough to secure progression if Orlando Pirates fail to defeat Platinum in a concurrent game in Soweto. 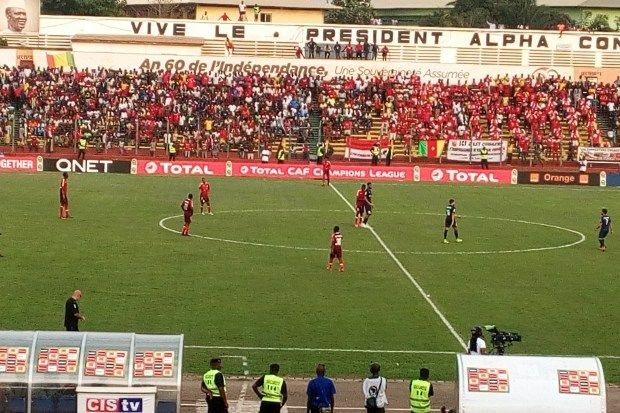 Horoya and Esperance played to a 1-1 draw in their Matchday 1 meeting back in January, with Ocansey Mandela opening the scoring for the West Africans, only for the Tunisian visitors to hit back in injury time at the end of the game through Anice Badri. Angolan referee Helder Martins de Carvalho will take charge of the game in Rades.